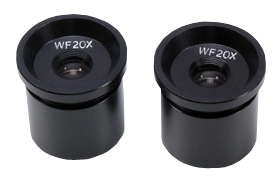 x20 widefield eyepieces to fit SX10 series stereos. Doubles the magnification effect of the objectives. x15 widefield eyepieces, gives 1.5x the magnification of the objectives used. A stage micrometer with real scale for calibrating the measuring eyepiece for each objective pair. Attache type carrying case with cut shapes for the microscope and accessories. Good quality and complete with keys.